The U.S. Department of Health and Human Services Action Plan to Reduce Racial and Ethnic Health Disparities (HHS Disparities Action Plan) is the most comprehensive federal commitment to date for reducing, and eventually eliminating disparities in health and health care. Through the HHS Disparities Action Plan, the Department of Health and Human Services (HHS) provides a coordinated framework for departmental agencies and office to streamline and institutionalize programmatic and policy efforts, as well as promote integrated approaches and evidence-based programs, so that all Americans have the chance to live the healthiest lives possible. This report provides an overview of the four Secretarial priorities and five goals that make up this strategic plan. 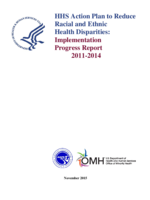 The report also describes some of the major actions and activities that agencies have undertaken to implement the HHS Disparities Action Plan since its original publication in April 2011. The implementation progress report is not meant to be an exhaustive list of all of the current research, policies, and programs the Department is supporting to improve minority health, but rather provide several illustrative examples of important work in this area. ASPE co-chairs the HHS Health Disparities Council. ASPE leads an evaluation of the Disparities Action Plan and this report is an outcome of that work.